I owe this post to all of the amazing people who took the time to put DDLC in the spotlight, allowing it to reach these heights of which I never thought even one tenth would be possible. All the gaming news outlets that have covered the game in some form, including IGN, Kotaku, Polygon, PC Gamer, Siliconera, Rock Paper Shotgun, and many others. And even more so, all the amazing players who took the time to play DDLC and help share it with the world on Twitch and YouTube. There are far too many to list, but here are a few: Alpharad, Jesse Cox, Lost Pause, iijeriichoii, CinnamonToastKen, Game Theory, Game Grumps, jacksepticeye, Pewdiepie, and MANY more. I wish I could list them all. The fact is that all of you took a risk putting DDLC in the spotlight – it’s not often that visual novels and/or romance games are given the treatment that you gave it. It runs the risk of dividing your viewership or not having enough people interested to have justified your time investment. I recognize that you may have had to ask yourself that before putting DDLC in the spotlight, and that’s why I’m extra appreciative towards everyone who went through with it. Here on my end, I’m doing my best to keep up with everything business- and development-related so that I can give the community more of what they want. It’s all very new and strange to me, so I’m still growing into it, and I greatly appreciate all the support everyone has given me these past couple months. I hope to continue to work on cool stuff that the DDLC community can enjoy. While I don’t have anything to announce right now, I’m considering some options for providing more DDLC-related content to fans in the future. I want to do my best to continue giving the Literature Club the attention it deserves while I work on my next game. 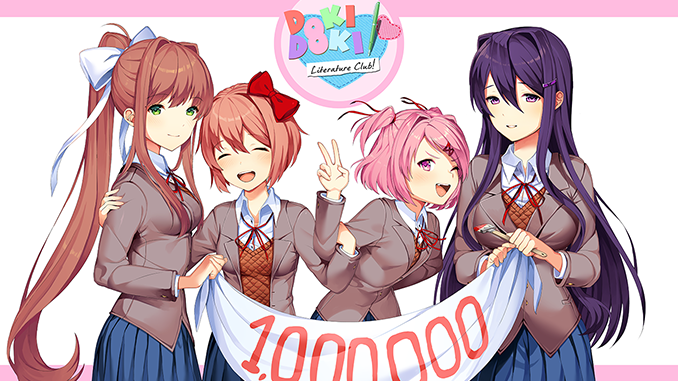 Thank you for reading and for continuing to be a part of the DDLC community!